Romans 1:20 says God’s “invisible qualities—His eternal power and divine nature” show themselves in what He has created. Our national parks indeed are our “best idea,” as historian, writer and environmentalist Wallace Stegner noted, but they were God’s idea first! The National Park Service’s 2016 centennial brings an enormous emphasis on our parks. Their magnificent beauty will be highlighted, as well as the abundant opportunities for hiking, boating camping, etc. Life Lessons from the National Parks fills this spiritual gap by continuing—and expanding on—Muir’s vision. The book’s inspirational stories chronicle remarkable lands, events and people, but more importantly, they reflect the God who superintends each one. It’s a four-season exploration of more than forty parks, memorials and historic sites, and includes tips for planning your own visits. This book fascinated me. Despite the obvious title, Life Lessons doesn’t fall into a neat category. Many may easily overlook the delightful, easy-to-read book. Musco gives the background to the various national parks, including interesting trivia, and spotlights one particular historical aspect. From that focus, she moves into a spiritual life lesson. I very much enjoyed reading this book about more than forty of the national parks, monuments, historical parks, national memorials, military parks, and other national shrines run by the National Park Service. I especially liked all the interesting historical tidbits. I found the spiritual applications and life lessons uplifting. Life Lessons is an enjoyable read. The author deftly relates lessons she learned through the awesome beauty of God’s creation to meaningful life lessons from his Word. The nuggets of American history interspersed throughout the book provide some interesting factoids that aren’t necessarily included in the formal education everyone receives. We especially loved learning about the lesser-known parks. I loved the workable tips and unique insights presented by Penny Musco. This book, spiced with humor and encouragement, propels me to a greater appreciation of our national parks [and] a deeper relationship with the Creator. 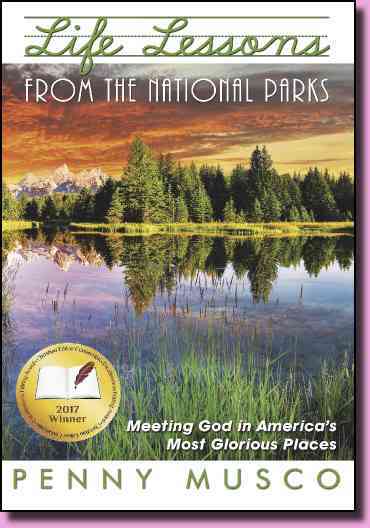 As a Christian, hiker, and lover of parks, I’m impressed with Penny Musco’s effort to combine powerful devotional thoughts and challenges with highly descriptive narratives of many of our country’s finest national parks and monuments. The extra information about tours, accommodations, and amenities are a nice bonus. This will become an often-consulted reference book in our home.